Despite starting all 16 games, Trent Dilfer threw four touchdown passes during the entire 1995 season. Aaron Rodgers threw six touchdown passes during the first half of a game last year. The following article aims to ensure that your daily fantasy quarterback selections perform closer to the latter than the former. Efficiency metrics – such as touchdown percentage and passer rating – have a stronger correlation to quarterback fantasy points than passing attempts. In fact, quarterback is the only position where opportunity does not strongly correlate with fantasy points. When selecting a quarterback, efficiency should be emphasized over volume. Table 1 shows how various statistical categories correlate to fantasy points per game using FanDuel and DraftKings scoring systems. The sample includes qualified quarterbacks from 2013 and 2014. An opportunity isn’t worth as much to a quarterback as it is to other positions. Over the last two seasons, a pass attempt produces an average of 0.44 FanDuel points, a rush attempt 0.55, and a receiving target 1.30 – quarterbacks have the least to gain from each additional opportunity. Good fantasy quarterbacks separate themselves by how efficient they are. For example, Peyton Manning, Eli Manning, and Derek Carr posted nearly identical per-game pass attempt averages in 2014 – Peyton 37.3, Eli 37.6, and Carr 37.4 – yet ended up with drastically different fantasy outputs: Peyton averaged 20.5 FanDuel points per game, Eli 17.7, and Carr 12.7. A quarterback's pass attempt volume can be misleading because many times, an increase in volume is actually due to a lack of efficiency. Again take Carr, who led the league in third-and-long pass attempts in 2014, mainly thanks to his bottom-five passer rating on first and second downs. 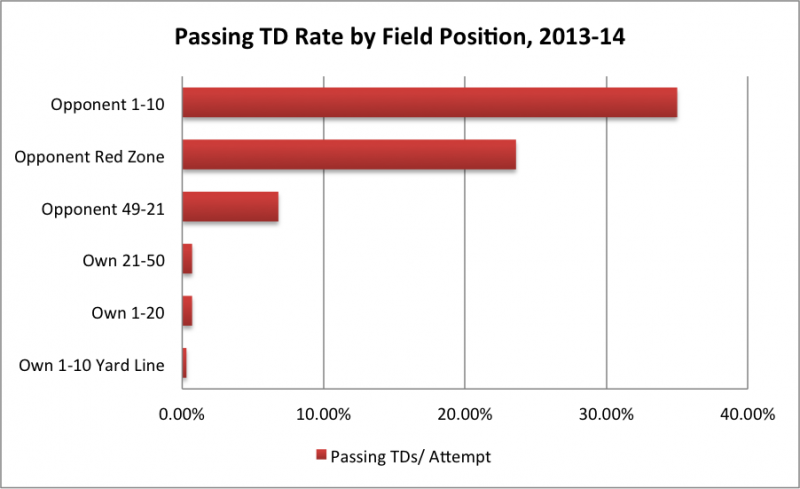 League-wide, pass attempts on third-and-long yield 11 percent less FanDuel points than a league-average pass attempt. A quarterback shouldn’t be considered viable solely on the basis of a high number of attempts. If he's playing in "garbage time", there's a solid chance he played like garbage to begin with. Moreover, a pass attempt while trailing by 14 or more in the second half is worth only 0.38 FanDuel points on average, 14 percent less than in a league-average situation. The sample is somewhat biased because the best statistical quarterbacks don’t trail as much, but that’s the point: teams acquire and maintain leads by accumulating yardage and – more importantly for a fantasy quarterback – scoring touchdowns. Passing touchdowns account for a larger percentage of quarterback fantasy points than any other stat, so it is crucial to target quarterbacks in games where they have solid touchdown potential. A signal-caller will struggle to throw for scores if he can’t move his team down the field and ultimately get them into the red zone, where over two-thirds of all passing touchdowns occur, as you can see in Figure 1 below. A quarterback’s touchdown potential increases when his team has an overall advantage in a particular matchup. He may be able to ride his running game down the field, or his defense may provide him with short fields to work with. Either way, if he gets into the red zone, his touchdown potential – and therefore fantasy value – drastically increases. 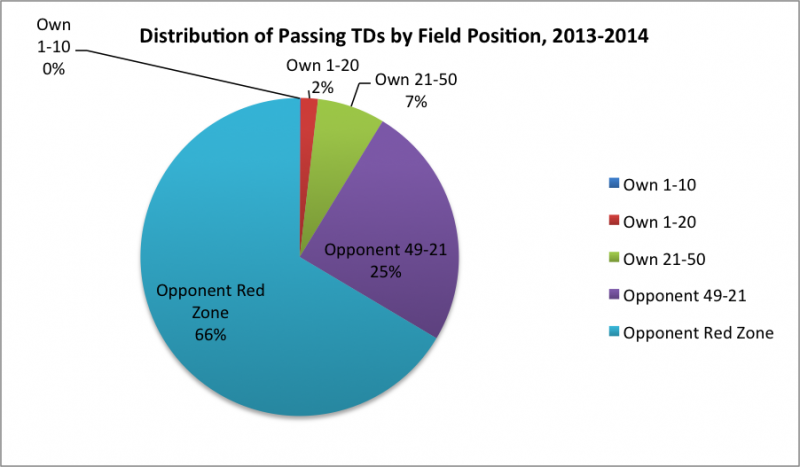 As you’ll see in Figure 2, the average passer has a 35 percent chance at a touchdown inside the opponent’s 10-yard line, but those odds precipitously drop to seven percent outside the red zone, and one percent in offensive territory. Since attempting a pass from inside the red zone significantly increases the likelihood of throwing a passing touchdown, quarterbacks on teams who are likely to be in good field position throughout the game should be targeted. Vegas point spreads and over/under totals are useful in projecting which team has an advantage in a given game. The Vegas lines are particularly useful for detecting value among lower-tier quarterbacks who are in a good situation to return value. For example, Ryan Fitzpatrick came into Week 13 of 2014 averaging 1.2 touchdown passes per game, but threw six that week against the Titans. Was there anything that could have tipped you off that a big day was possible? It turns out there were some bits of information capable of foreshadowing the "FitzMagic": the Texans were seven-point favorites and the contest had an over/under of 43 points – that is, they were projected to score 25 points, which exceeded both the league-average of 22.6 and the Texans’ own average of 22.0 coming into the game. Being projected to score more points than usual meant the Texans were expected to score more touchdowns than usual. An increase in total team touchdowns usually equates to an increase in passing touchdowns: league-wide, 68 percent of all offensive touchdowns come through the air (Houston checked in at 65 percent despite the presence of Arian Foster). Quarterback is, on average, the most consistent fantasy position, mostly because it gets the greatest amount of opportunities to score fantasy points throughout the course of a game. In 2014, the league leader in pass attempts averaged 41.1 per game, by far eclipsing the leaders in running back touches (28.1), wide receiver targets (11.5), and tight end targets (8.7). To measure the consistency – or volatility – of a data set, divide it’s standard of deviation into its mean, giving you the coefficient of variation (CV). Figure 3 displays the league-average CV for each position, which was calculated by taking the average CV of all qualified players at each position in 2013 and 2014. The shorter the bar, the more consistent the position is. Despite being projected for the same amount of points, the two pairs have a significantly different floor and ceiling due to differences in positional consistency. Pair 1 has a higher floor and is a better choice in a cash game, while Pair 2 has a higher ceiling, making it the superior tournament option. CV is not meant to take the place of projected point-per-dollar values. Rather, CV should be combined with projections to clarify the possible range of outcomes – or, floor and ceiling – associated with each player. Once floor and ceiling have been calculated, divide each by the player’s salary to arrive at projected floor and ceiling values. Throughout the NFL season, I will apply CV to 4for4’s award-winning projections to arrive at ceiling and floor values. While stud quarterbacks often end up with the best floor points-per-dollar values, minimum-priced or near-minimum priced quarterbacks can certainly be viable. Usually filling in for an injured or benched starter, inexpensive quarterbacks can return value without even having a “good game” by NFL standards. For example, a $5,000 quarterback can hit 2x value (10 points) on FanDuel with a game like 175 passing yards, one touchdown and one interception, or 150 yards, one touchdown and no interceptions, or even 250 yards, one touchdown and four interceptions. Even hitting 3x value (15 points) can be done with a rather pedestrian outing – 250 passing yards, one touchdown, no interceptions and 10 rushing yards would get the job done, as would other mediocre passing lines such as 200 yards, two touchdowns and one interception or 250 yards, two touchdowns and three interceptions. Obviously, the opposing defense has a large effect on a quarterback’s fantasy output. The strength of an opposing matchup is often judged solely on how many fantasy points they allow per game to the position in question. However, using schedule-adjusted fantasy points allowed (aFPA, available exclusively to 4for4 subscribers) is a much more effective way of assessing matchup quality than analyzing the unadjusted figures. For example, a defense that gave up league-average performances to studs such as the aforementioned Rodgers and Andrew Luck is a lot more impressive than one that allowed league-average performances to below-average fantasy performers like Geno Smith and Brian Hoyer. But both defenses would have looked the same on paper if you weren’t using schedule-adjusted fantasy points. When a quarterback faces an opposing defense that blitzes often, his volatility tends to increase – there’s a higher likelihood that he beats the blitz for big plays or endures drive-killing sacks. Throughout the season, injuries to the opposing defense can cause a lot of turnover that affects how successful the opposing pass rush or pass coverage is. An injury to an opposing pass rusher may afford a quarterback the time necessary to successfully execute a downfield passing attack. If the opposition’s secondary is banged up, receivers may have an easier time getting open. On the other hand, an injury along the offensive line may result in sacks and a lack of sufficient time in the pocket to let routes develop downfield. 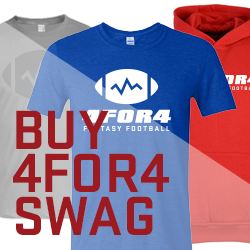 4for4’s Fantasy News section does a great job providing up-to-date injury news and analysis. As I mentioned before, any time a quarterback’s team has a strong overall matchup, he stands to benefit from good field position and his touchdown potential thereby increases. On the other hand, if his team has a poor overall matchup, its quarterback's ability to produce fantasy points will many times be hindered even if he sees an uptick in pass attempts. Keep in mind that in each matchup, players aren’t the only ones facing off – coaches are going against eachother as well. For example, Chip Kelly’s unique coaching mind has led to an offensive scheme that has inflated his quarterbacks' numbers thus far. On the other hand, Bill Belichick often gains an upper hand by scheming to take away the opposition's best receiver, which can hurt the value of any quarterback that faces Belichick and is highly dependent on a singular receiving option. Quarterbacks tend to make the receiver rather than the other way around, but sometimes a wide receiver is such a beast that he'll singlehandedly increase the upside of his quarterback -- this is typically happens with young, "breakout" receivers. This type of situation is useful in tournaments, where a quarterback should always be stacked with at least one of his receivers. To illustrate what a breakout receiver can do for a quarterback, take Ben Roethlisberger’s 2014 season for instance. In the first six weeks, he returned an average FanDuel value of 1.90x (the league average is 2.13x), and failed to hit 3x value once (the league average is 18 percent). But things changed after Martavis Bryant was activated in Week 7. Bryant gave Roethlisberger a premier deep threat (17.6 yards per target and 4 touchdowns on deep passes) and red zone threat (44 percent touchdown rate). In 10 games with Bryant, Big Ben returned an average FanDuel value of 2.8x, and hit 3x value 40 percent of the time. Wide receivers who suddenly break out can quickly turn typically low-scoring fantasy quarterbacks into viable tournament options. For example, in 2014 the Texans started three seemingly below-average quarterbacks – the aforementioned Fitzpatrick, Ryan Mallett, and Case Keenum – but they were able to reach 3x value on FanDuel 25 percent of the time due to the emergence of second-year breakout wide receiver DeAndre Hopkins. Similarly, the Browns trotted out three below-average passers in 2013 in the aformentioned Hoyer, Brandon Weeden, and Jason Campbell. Yet due to the emergence of Josh Gordon – and to a lesser extent, Jordan Cameron – they combined to post a respectable six games with 18-plus fantasy points. Then there was career backup Josh McCown, who stepped in at signal-caller for the Bears in 2013 and put up four games with 20-plus fantasy points in five starts, reaping the benefits of throwing to Brandon Marshall and emerging breakout Alshon Jeffery. When a wide receiver is still in the early stages of a breakout, his projections will err on the conservative side, failing to fully account for that receiver’s – and by extension, his quarterback’s — upside. Take advantage in tournaments by stacking a lesser-heralded quarterback and a talented breakout receiver candidate. This is not an ideal cash game strategy, however, as you don’t want your quarterback’s entire value hinging wholly on the success of one receiver. There are a number of quarterbacks whose value may be propped up by one of their wide receivers in 2015. With plenty of room for growth, Carr's numbers this season could benefit from Amari Cooper's excellent route-running and play-making chops. Sammy Watkins' speed could give whoever emerges as the Bills’ quarterback some value. I've already discussed Hopkins, whose solid all-around game may prop up Hoyer’s numbers in Houston just as he did for the Fitzpatrick/Mallet/Keenum trio in 2014. Then there are veterans such as the aformentioned Marshall and Eric Decker of the Jets, proven touchdown-scorers who could certainly increase the value of Ryan Fitzpatrick. These situations don’t last long before prices adjust, so it’s important to anticipate them in advance to fully capitalize. Quarterbacks see an increase in both efficiency and touchdown production when they play at home, as shown in Table 2 below. For daily fantasy purposes, what’s important to note is that home field advantage doesn't appear to be fully priced in to quarterback salaries. In Table 3 below, you can see that quarterbacks at home returned slightly more value on both FanDuel and DraftKings last season. Playing at home is not a prerequisite to a strong fantasy day for a quarterback, but it can be used to pinpoint the safest cash game plays. Remember, a quarterback’s success depends not just on himself, but on the team around him as well. His receivers, offensive line, running game, and defense are at a greater risk of faltering on the road. Quarterback is the only position where efficiency is more important than volume. Over one-third of a quarterback’s fantasy output comes from passing touchdowns alone – they are crucial for quarterback to score fantasy points. 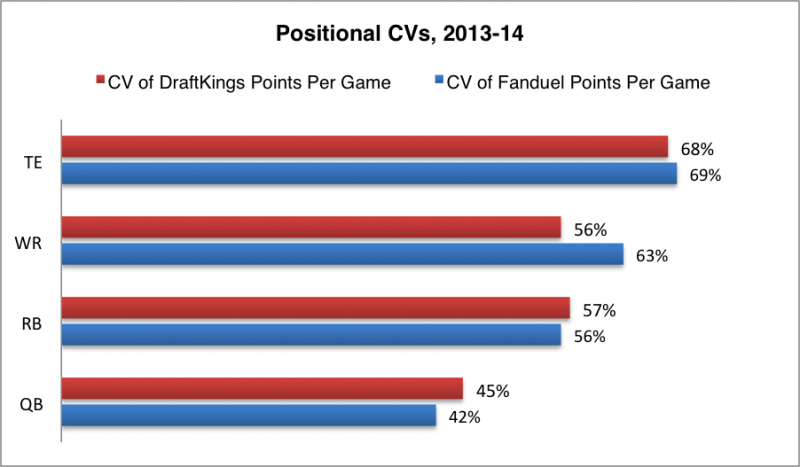 Quarterbacks are the most consistent fantasy position and tend to have the highest floors. Analyze the opposing matchup by looking at opposing pass rush, pass coverage, Vegas line, and coaching matchup. Strong receiver play can increase the value of an overlooked quarterback. Always stack at least one of a quarterback’s receivers with him in tournaments. A quick refresher on correlation: The scale is -1 to 1. Positive values indicate variables move in the same direction, while negative values indicate variables move in opposite directions. An absolute value of 1 means perfect correlation. Absolute values above 0.7 are considered strong, those between 0.3 and 0.7 are moderate, and those under 0.3 are weak. To qualify, a quarterback’s season needed at least 6 games played and 10 fantasy points per game. Third-and-longs are classified as all plays on third or fourth down and 6 or more yards to go. This was calculated using all plays from 2013 and 2014, 3rd-and-long passing attempts averaged 0.39 FanDuel points per attempt. The league average was 0.44. This was calculated using FanDuel scoring for the entire NFL population of quarterbacks during 2013 and 2014. This was calculated using league-wide 2013-2014 data. To qualify, a player’s season needed 6 games played, with a 10.0 fantasy point-per-game average for quarterbacks, 8.0 for running backs and wide receivers, and 6.0 for tight ends. All deep passing stats are courtesy of PFF.